Commissioning of PAUCam, the imager for the Physics of the Accelerating Universe survey, is complete, and routine science exploitation is under way (for first-light images, see earlier news item). PAUCam is a visiting instrument instrument at the WHT, and is available for use by astronomers from the ING community. So far, about 5000 science exposures have been obtained, covering ~1.5 square degrees of sky with the full set of 40 narrow-band filters, and about 5 square degrees with a subset of filters. This is equivalent to having imaged about 500 square degrees of sky with only one filter in 9 nights. The PAUCam filter system (left) and one of the 5 trays mounting 40 narrow-band filters (right), used to obtain deep images and low-resolution spectroscopy in the wavelength range 450-850 nm on the central 8 CCDs (each CCD has 4k×2k 15-micron pixels). Credit: PAU team. Large format: PNG. 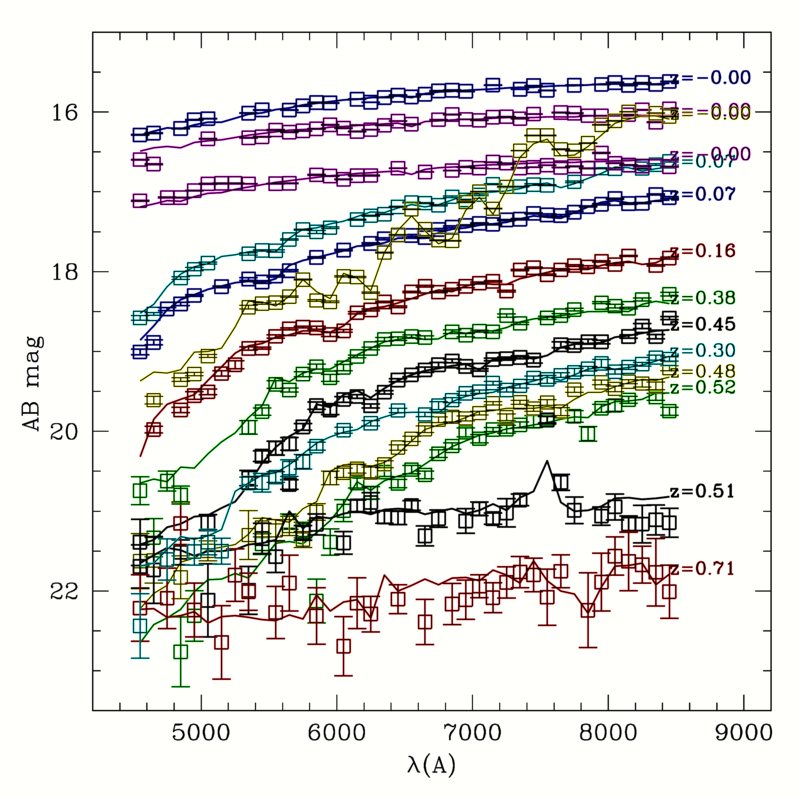 These data have already been reduced and calibrated, resulting in 75,000 low-resolution spectra of objects iAB < 23 mag. The data reduction (5 terabytes of data, 71 million object measurements) was carried out in record time (approximately one day of work) using the infrastructure of the Port d'Informació Científica (PIC) and the preliminary pipeline designed by the PAUCam community. Comparison between calibrated PAU spectra of stars and galaxies (squares, observed in April 2016) and spectra of the same objects taken by SDSS (curves). The number at the right end of each spectrum indicates galaxy redshift (0.00=star). Credit: PAU team. Large format: PNG. The PAU Survey aims to provide low-resolution spectra via narrow-band imaging, in 100 square degrees where deep weak-gravitational lensing data are already available. This will yield detections of several several million galaxies to iAB < 23 mag. PAUCAM is also available for other science projects requiring imaging over a field of view ~ 1 square degree (central 40 arcmin unvignetted). Narrow-band imaging can be used to obtain the spectral energy distributions of all objects within this field of view, and broad-band filters (ugrizY) can also be used. PAU Survey and PAUCam web site. First light on PAU Camera.